As organizations embrace the cloud, Big Data, IoT, and increased regulatory requirements, there’s one bottleneck that must evolve in order to handle the massive amounts of data that needs to be accessed, transferred, and stored: tape. 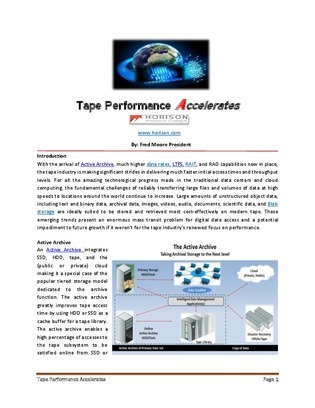 Luckily, this paper details the recent tape developments that are making significant strides in delivering faster initial access times and throughput levels, and can reliably transfer large files and volumes of data. Read on for the latest on Active Archive, too—a solution with higher data rates, LTFS, RAIT, and RAO capabilities now in place.